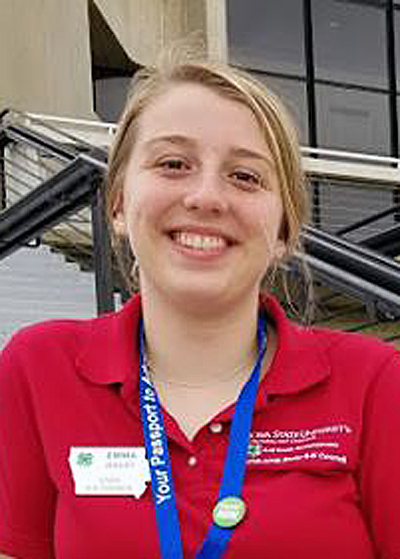 Emma Bailey, Webster City, has been selected to serve as an ambassador for 4-H as an Iowa State 4-H Council representative. Iowa State 4-H Council is composed of approximately 40 energetic and positive high school juniors and seniors who act as ambassadors for 4-H. One of their major responsibilities is planning the Iowa 4-H Youth Conference held in Ames every June. Members are selected from their extension areas through an application and interview process. The youth meet 4 times during the year at the State 4-H Camping Center. They get to know each other through team building activities, plan conference, promote 4-H, help to ensure funding for 4-H programs, and form friendships that last a lifetime. Bailey will serve Hamilton County 4-H by meeting with county council and 4-H groups in their local areas as well as serving at The State Fair, state 4-H events, and attending leadership workshops. Bailey is a member of the Boone Boosters 4-H Club and is the daughter of Kent and Milissa Bailey.